- Create, maintain, and monitor jobs; administer jobs and alerts; automate (setup, maintenance, monitoring) across multiple databases and multiple instances; send to "Manage SQL Server Agent jobs"
The Microsoft has created this credential to assess the knowledge and understanding of a candidate in the area as above via the certification exam. 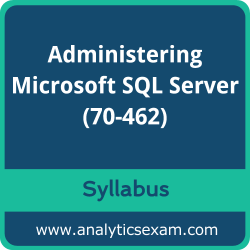 The Administering Microsoft SQL Server (70-462) Certification exam contains a high value in the market being the brand value of the Microsoft attached with it. It is highly recommended to a candidate to do a thorough study and also get a hand full of the practice to clear Administering Microsoft SQL Server 2012/2014 Databases exam without any hiccups.